THE NUMBER OF people homeless in Ireland has passed the 7,000 mark for the first time as the crisis continues to deepen. 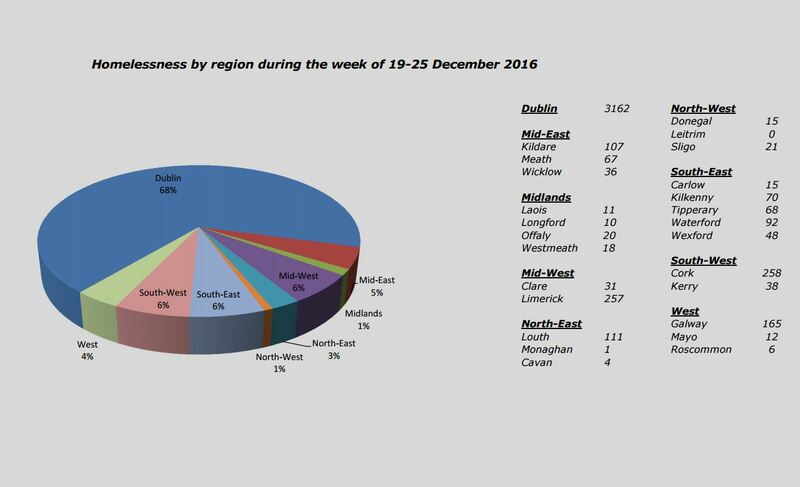 The latest official figures show that 7,148 people (including over 2,500 children) were in emergency accommodation in the week before Christmas 2016, and increase of 36% year-on-year, and a massive 91% hike on the figures seen two years ago. A number of homeless charities have this morning called for urgent action from the government in relation to the crisis. The Peter McVerry Trust has called on Housing Minister Simon Coveney to introduce a vacant housing property tax in order to stimulate movement among owners of dormant properties, and to “establish teams of Empty Homes Officers”. “Peter McVerry Trust is urging the Minister to fast-track measures to get empty homes back into use,” said Pat Doyle, chief executive of the charity. We have around 50,000 empty homes in Irish cities or 13 empty homes for every homeless adult. That is in an intolerable and deeply frustrating situation. Focus Ireland meanwhile warned that the crisis continues to deepen. The charity welcomed the fact that the number of families homeless did not rise in December, but decried the Government’s voting down an anti-homeless amendment the Focus Ireland had proposed for the Residential Tenancies Bill at the end of last year as “a missed opportunity”. “It is terrible to see over 7,000 people homeless for the first time on record. This is wrong and totally unacceptable,” said CEO Ashley Balbirnie. We worked to support over 230 families to move out of homelessness into secure homes in the first ten months of last year. However, as these new figures show there is still much work to be done if we are to end this homeless crisis. Reacting to the news, the Simon Communities has urged the Government to fast-track its new action plan for housing and homelessness. “Rebuilding Ireland was a much needed and positive step but it is critical that we don’t lose momentum and urgency,” said spokesperson Niamh Randall. While it is welcome to see some slowdown in the numbers of families and children entering emergency accommodation and progress with people moving out of homelessness, the numbers remain far too high. Email “Ireland's homeless figure has just passed 7,000 for the first time”. Feedback on “Ireland's homeless figure has just passed 7,000 for the first time”.